I finally got a new makeup bag! My old one was a good two years old, and travelled with me everyday to work, accompanied me on trips, and even jetted internationally, baby. It was from Forever 21 (they do lovely makeup bags!) hot pink with white polka dots, and was very tatty by last week. The plastic had torn, and it would scratch my skin every time I reached in to pull something out of my handbag, and one of my lip glosses had exploded in it, and there had been all manner of leaks and staining. It was NOT pretty. I should have taken a photo of it perhaps, but it was just so gross I chucked it away instead. I’d been meaning to get one since the summer, but just hadn’t been able to find The ONE. Until last week that is. By a serendipitous twist of fate, while in Shibuya, I decided to pop into Forever 21 for the first time in absolutely ages. 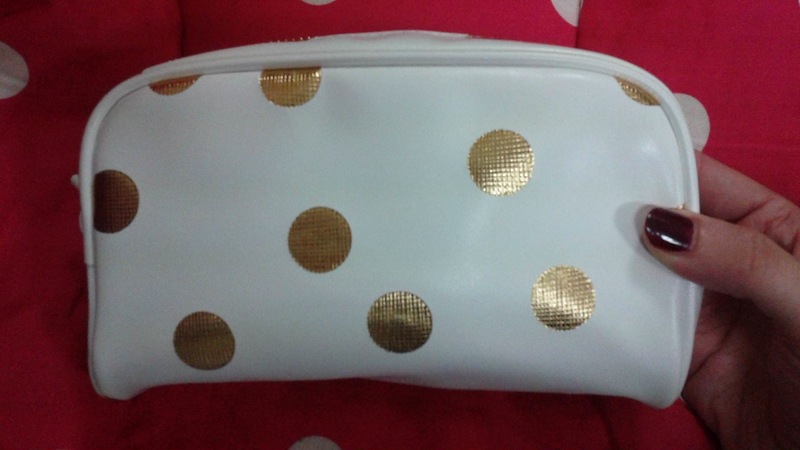 There was an array of makeup bags and it did take me a while to choose, but in the end I settled on this beauty, white with gold polka dots. Three words for you – I LOVE IT! It screams classy. There were two other variations: mint green with gold dots, and black with gold dots, but the white was simply the most beautiful. I was worried about it getting grubby in my handbag – I can tell you, little Timmy Time Timmy no longer has fleece as white as snow after hanging around in there, looking after my keys – but it was just too glamorous to resist. So I’m now the proud owner of the perfect makeup bag (for me), and highly recommend taking a look in Forever 21 if you’re ever on the hunt for an affordable but cute one in the future. P.S. 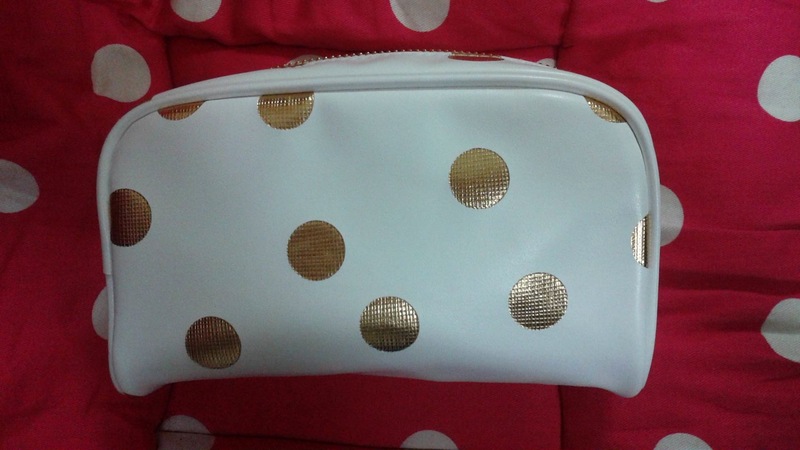 – Did I mention how in love I am with this makeup bag? Oh I did? Sorry. I’m so head over heels it’s making me giddy. 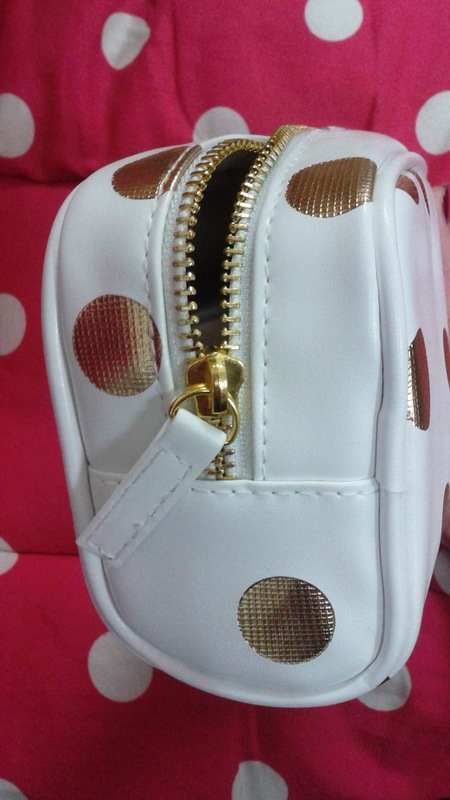 I love this bag as well! We don’t have Forever 21 in South Africa. Boo! Love your new makeup bag! I also really love Forever 21–you can never predict what the heck they’re going to have! I went last weke and got 2 GORGEOUS fit and flare holiday dresses for just $8 each! Crazy good deal! What are the cosmetic bags like in Japan? I bet they’re super cute and sweet. I own like 10 different design makeup pouches in different sizes and for fun, I just like oogling them :). I’m a big fan of their jewellery too, actually – the prices are really good! Very cute, I never thought to look in Forever 21 for makeup bags. Thanks for posting this! They really do! =) And, the price cannot be sweeter, too!